It is often difficult to fully understand – much less predict – major changes or shifts in ecosystems. 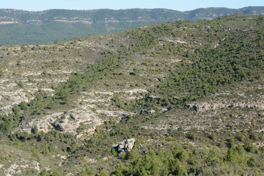 Nevertheless, signs of vegetation loss or soil erosion, for example, may indicate that a particular ecological threshold has almost been reached. When that threshold is crossed – producing a rapid or irreversible transition from one ecosystem state to another, with serious socioecological consequences – we speak of a "catastrophic shift". We inventoried, documented, and evaluated natural resource management practices that were already applied locally. We developed and applied a simple but effective method to assess the resilience of natural resource management practices. Each set of guidelines is available in English, Spanish, Greek, Italian, and Portuguese. The results stress the importance of preventive action before a fire event. Among the land management practices that can be implemented before a fire, fuel management appeared to increase forest resilience the most. It minimizes fuel load and connectivity in order to reduce fire risk. 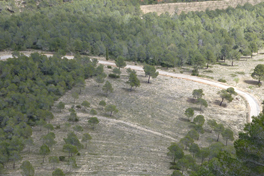 Management of forest regeneration (after a fire) and reforestation should promote a low-density, spatially differentiated and species-diverse canopy, which also reduces outbreaks of pests. While forest regeneration from seed banks is only possible with long time intervals between fires, regeneration from resprouting individuals fosters a quick recovery. In the Mediterranean, land abandonment is widespread and on the rise. The environment of abandoned land can change in unexpected and diverse ways: degraded land might not recover – or it might promote new risks such as soil erosion, flooding, or fire. Land management options include revegetation, rotational grazing, or alternative uses of land such as beekeeping, biodiversity management, tourism, or wind/solar energy production. It should also be considered that land that is not used economically at present, can become valuable in future – and thus knowledge and infrastructure may need to be maintained. Cooperation and new forms of management (e.g. silviculture) help to overcome labour availability constraints. Overgrazing reduces vegetation cover, which increases soil erosion and leads to a reduction in soil fertility, and thus productivity. CASCADE studies have shown that if surface cover falls below 30-40%, soil erosion increases sharply because of the high connectivity of bare patches. 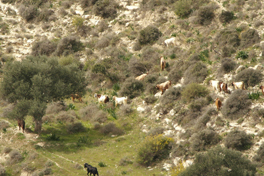 Promising management practices to control vegetation cover include rotational grazing, fodder provision, and area closure. To prevent sudden shifts, cost-effective management interventions that are acceptable to stakeholders should be applied before thresholds are reached. Interventions should include bundles of different practices used in combination, to mitigate the pressure and reduce vulnerability. Such interventions should also be supported by policy.